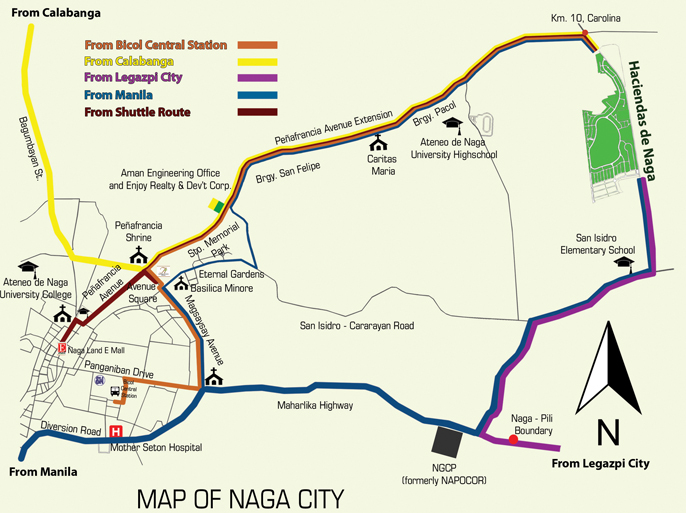 Follow the map below to get to Haciendas De Naga from nearby locations. It’s best to use the Google Maps or Waze application on your smartphone or your car’s on-board navigation aid for the most up-to-date routing information. Generally, however, to get to Naga from Manila, you’ll need to drive to the Pan-Philippine Hwy/AH26. Then you’ll need to take the Metro Manila Skyway, R-3, Calabarzon Expy and Tiaong – Lipa Rd to Garcia – Rosario – San Juan – Candelaria Rd in Padre Garcia. After that, you’ll need to follow Garcia – Rosario – San Juan – Candelaria Rd and Quezon Eco Tourism Rd to Pan-Philippine Hwy/AH26 in Lucena. Next, you’ll need to continue on Pan-Philippine Hwy/AH26. Finally, you’ll need to drive from Rolando R. Andaya Hwy to Naga.